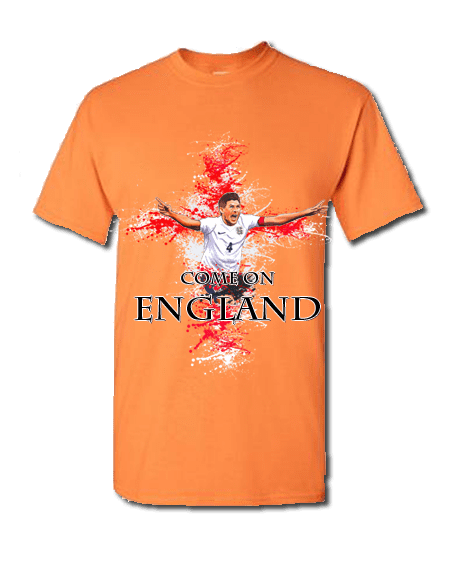 Steven Gerrard England T-Shirt featuring a cartoon design of Gerrard with a St George’s cross background splash from an original drawing by Mark Reynolds. This exclusive England T-Shirt is only available from Mr-Art in a wide range of colours and sizes and is printed using the newest direct to garment printing methods. Steven George Gerrard is an English footballer who plays for and captains both Premier League club Liverpool and the England national team. He has played much of his career in a centre midfield role, but he has also been used as a second striker, holding midfielder, right back and right winger. Gerrard, who has spent his entire career at Anfield, made his début in 1998. Gerrard made his international debut in 2000, and has since represented England at the 2000 and 2004 European Championships, as well as the 2006 World Cup – where he was the team’s top goalscorer with two goals – and the 2010 World Cup. Gerrard has been described as “one of the greatest English midfielders inhistory, a real leader and a tireless runner with superb vision…with his striking fromdistance feared around the world and a prolific scorer for a midfielder.